Thomas O. Paine grew up an ordinary boy in northern California during the Great Depression of the 1930s. He would go on to serve as NASA’s third administrator, leading the space agency through the first historic missions that sent astronauts on voyages away from Earth. On his watch, seven Apollo flights orbited our planet and five reached our moon. From those missions came the first of twelve men to walk on the moon. In Piercing the Horizon, Sunny Tsiao masterfully delivers new insights into the behind-the-scenes drama of the space race. Tsiao examines how Paine’s days as a World War II submariner fighting in the Pacific shaped his vision for the future of humankind in space. 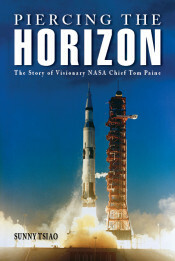 The book tells how Paine honed his skills as a pioneering materials engineer at the fabled postwar General Electric Company in the 1950s, to his dealings inside the halls of NASA and with Johnson, Nixon, and later, the Reagan and Bush administrations. As robotic missions begin leaving the earth, Tsiao invites the reader to take another look at the plans that Paine articulated regarding how America could have had humans on Mars by the year 2000 as the first step to the exploration of deep space. Piercing the Horizon provides provocative context to current conversations on the case for reaching Mars, settling our solar system, and continuing the exploration of space. Sunny Tsiao began his career as a Space Shuttle mission training instructor at the Johnson Space Center, and he has worked in aerospace and defense for over thirty years. Tsiao is an aerospace engineer who writes and completes research projects for the Department of Defense (DOD), the National Aeronautics and Space Administration (NASA), and the Federal Aviation Administration (FAA). He holds bachelor and master of science degrees in aeronautical and astronautical engineering from Purdue University. Tsiao is the author of Read You Loud and Clear, a NASA history of the US spaceflight tracking and communications network. He lives with his wife Lisa in Monument, Colorado.